1) Look carefully at the diagram and make sure you understand what it is about. 2) Use your answer sheet to make notes on, but remember to cross them out when you have finished your answer. 3) Begin your answer by writing a summary sentence to introduce what the diagram or flow chart is about. 4) Note that the passive is often used in this task. 5) Count approximately how many words you write. 6) You should try not to write too much! 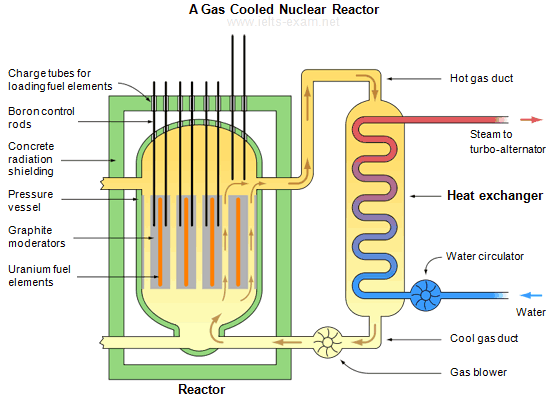 The diagram below shows the production of steam using a gas cooled nuclear reactor. A gas-cooled nuclear reactor consists of the reactor itself and a heat exchanger. The reactor contains uranium fuel elements which are surrounded by graphite moderators and topped by charge tubes for loading fuel elements, and boron control rods. The whole reactor is contained in a pressure vessel surrounded by a concrete shield. From the reactor the hot gas flows through a duct into the heat exchanger which is outside the concrete radiation shielding. In the heat exchanger, steam is generated in a secondary loop. There a pipe brings in water which is heated to steam, and this then flows out to the turbo-alternator. Meanwhile the hot gas sinks to the bottom of the heat exchanger and passes through a gas blower which pushes it into a cool gas duct and back to the reactor. As can be seen, this is a continuous cycle that keeps the reactor from overheating, while carrying away the heat and steam, which will power the turbines.